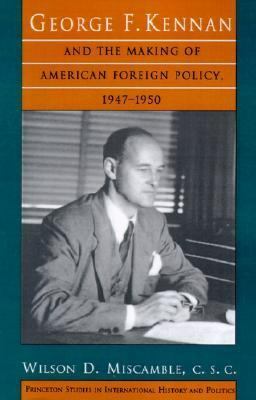 "This book is the most insightful treatment of George Kennan that has yet been published and the best work I know on the making of U.S. foreign policy during this period. The work is an astonishing scholarly accomplishment. Miscamble offers fresh interpretations and a new sense of the context in which policy was made and of the complex influences on the policymakers." --Richard H. Ullman, Princeton UniversityMiscamble, Wilson D. is the author of 'George F. Kennan and the Making of American Foreign Policy, 1947-1950' with ISBN 9780691024837 and ISBN 0691024839. Loading marketplace prices 103 copies from $5.00 How does the rental process work?